By now, we are all familiar with the legend of King Arthur. The story of King Arthur, Excalibur and the Knights of the Round Table has been retold time and time again on the big screen. The most recent retelling of the story, 20th Century Fox’s “The Kid Who Would Be King,” is a modern take on the legend, one that feels new and fresh. The film follows Alex (Louis Ashbourne Serkis), an ordinary boy who is the target of bullies at school. One night while fleeing from said bullies, Alex stumbles across the legendary Excalibur in a slab of stone. As the legend goes, he pulls the sword from the stone. By doing so, he awakens an ancient evil, Morgana (Rebecca Ferguson), dead set on enslaving mankind. With this, his adventure begins, and he must fulfill his destiny and become the hero he needs to be to save his country and the world. Along with him on his journey are his best friend Bedders (Dean Chaumoo) and the very bullies who pick on him at school Lance and Kay (Tom Taylor and Rhianna Dorris). Also, What version of the Arthurian legend would be complete without the wizard Merlin (Partick Stewart and Angus Imrie) to help along the way. 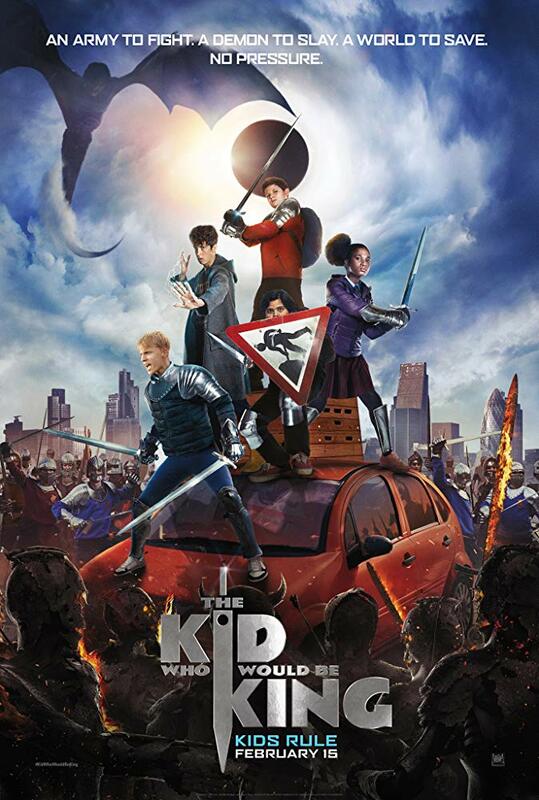 Directed by Joe Cornish (Attack The Block), “The Kid Who Would Be King” is a fun family film. It takes a lot of care to pay respect to the Arthurian legend, as well as making it work in a modern day setting. The special effects are significant, and the story is tense, especially for it’s PG rating. The performances by the young leads are excellent. Patrick Stewart and Angus Imrie, playing old Merlin and young Merlin respectively, deliver stand out performances of the same character. Louis Ashbourne Serkis, son of actor Andy Serkis, carries the emotional core of the film surprisingly well. Everyone else does a fantastic job helping him along his journey, as they are all equally as good. First and foremost, “The Kid Who Would Be King” is a very human story. The special effects and big battle sequences are there, but it narrows its focus on the kids. It’s about overcoming the odds and learning to be something more than you think you are, more than what the world thinks you are. The story is about family, friendship, and the importance of working as a team. With bullying and a world being turned against each other through politics and class lines a topic of conversation today, it resonates with what is happening with the world; it’s very timely. I was a bit skeptical going into this film, especially with its family-friendly PG rating. Walking out of it, I was pleasantly surprised by what I got. It’s a film that works as a great dark fantasy story, as well as a heartwarming family film. If you have kids, it’s fun for the whole family, and if you don’t, you will still be in for a good time.